Edward Lodewijk van Halen or commonly known as Eddie Van Halen was born in Nijmegen, Netherlands, January 26, 1955, he and his brother, Alex Van Halen, born to Jan Van Halen (1920-1986), a Dutch saxophonist who have Swedish ancestry and Eugenia van Beers (1914-2005), a Europe-Indonesia (Indo). This family emigrated in 1962 to Pasadena, California. Here, the father taught his son to play the piano immediately. Furthermore, they often start to fill in school music activities and a variety of places to invite some other musicians. At this time they decided to form a group of Mammoth. After some time working with David Lee Roth they decided to pull a vocalist, after Eddie to fill this position. After recruiting Michael Anthony on bass guitar player positions, the formation of this group was complete and they changed his name to Van Halen in 1974. Before the era guitar shredd popularized by Yngwie Malmsteen in 1984, 6 years before Eddie Van Halen had a successful first shook the world of music. two-handed technique or commonly called Tapping Tapping has managed to be absolutely toxic to more than half of U.S. rock guitarist. Tapping is not only technically, he also popularized the style of hard rock guitar that is very different from most guitar rock that is quite thick bluesnya game. Guitar solo on the song appearing in the group's debut album Van Halen surprising is the subject of discussion guitars at the time. Van Halen album was released in 1978 broke through the Billboard charts at position 15 and successfully sold 2 million copies of one reason is Eddie Van Halen guitar solo on the instrumental track. Name Eddie Van Halen took off because he popularized the technique of Tapping. Although contributions from vocalist David Lee Roth as an attractive and phenomenally well be underestimated, but the name Eddie Van Halen arguably more selling. Name more talking, and often given as Guitarist of the Year by music magazines. On the technical side Tapping into trademarknya, Eddie Van Halen is also known by his smile always appears in all conditions. No wonder young guitarists in the United States be respected. 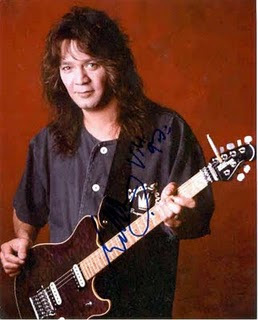 Eddie Van Halen and a guitar from Fender Stratocasternya different. Red body with white stripes to be one selling point. Next on the album lead singer David Lee Roth to be released is the Van Halen II (1979) and Fair Warning (1981), Diver Down (1982), and an album is the work of the 1984 Van Halen album, released in 1984. Album in 1984, Eddie Van Halen featuring a charming game keyboard. In fact, more and more people recognize common sounds and tracks in the game directly instead of a keyboard guitar technique. Directly managed to become champion in track 1 Billboard chart. In 1983, before the album was released in 1984, Eddie Van Halen has teamed up with the King of Pop, Michael Jackson. Eddie Van Halen took part in the Thriller album project which later sold over 20 million copies. He was Polish song called Beat It becomes slightly colored rock and dance. Do not forget to ask Eddie Van Halen guitar solos and techniques tappingnya in a song. The emergence of Eddie Van Halen on the song got a great response to the acquisition topped the Billboard charts for weeks. Van Halen's 1986 lineup changes with the decline, and David Lee Roth was replaced by Sammy Haggar. Even so, Eddie Van Halen still able to show the best game-playing guitar. The next album like 5150 (1986), OU812 (1988), for physical Unlwaful Knowledge (1991), and Balance (1995) is still quite capable of extending the breath in a world of Van Halen record. Not long after Van Halen returned to the entrance of vocalist Gary Cherone (ex-Extreme). Van Halen during the Gary Cherone era is considered by many as the worst sign of less successful album Van Halen III (1998). 2001 Eddie Van Halen mouth cancer, she was forced out of action for about 2 years to the healing process.